From the Department of Neurology (A.A., R.C., R.B., A.P.) and Department of Pathology and Immunology (A.P. ), Washington University School of Medicine, Saint Louis, MO. (A) Hematoxylin & eosin stain, (B) Verhoeff-van Gieson stain. 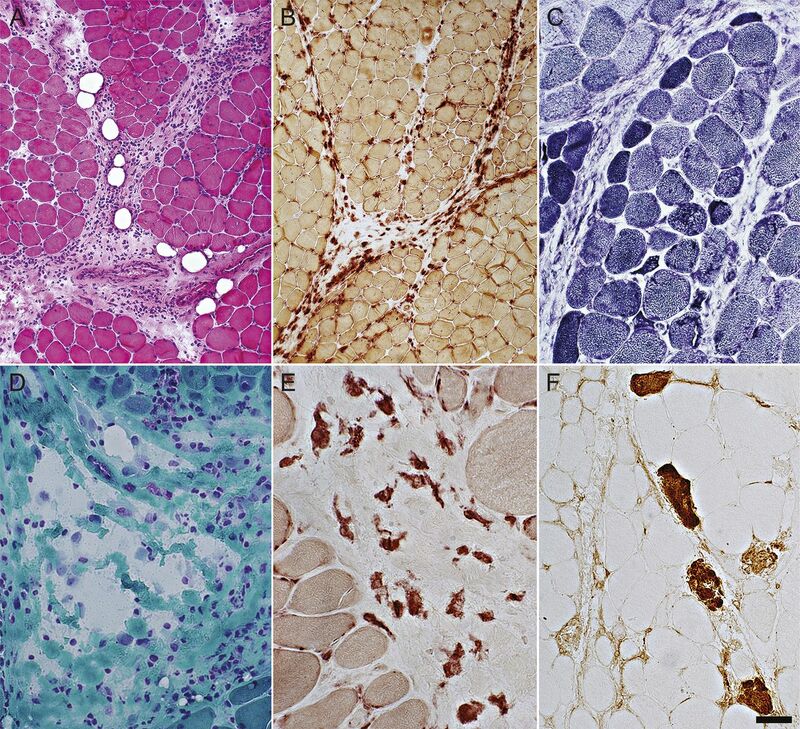 Muscle fiber size varies from very small to hypertrophied. 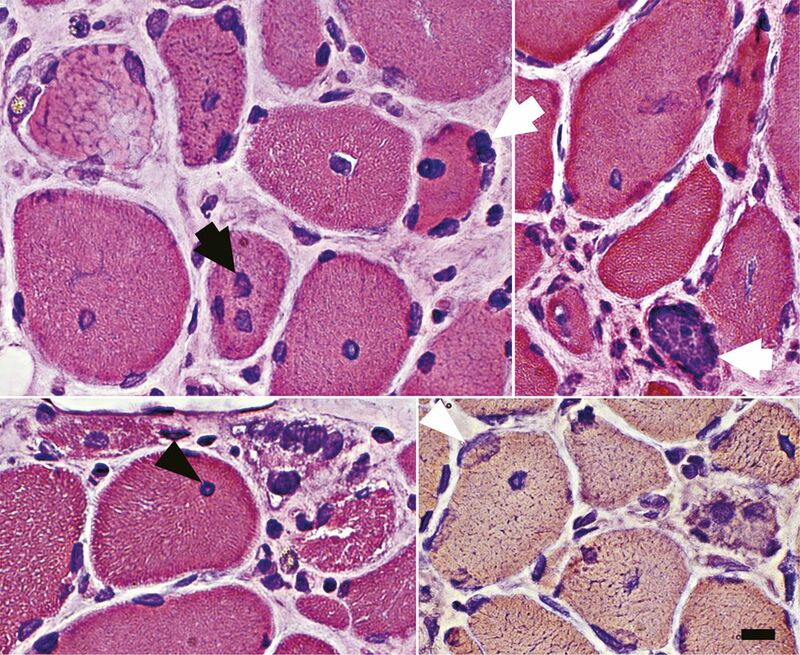 Some small muscle fibers have mildly basophilic, or darkly stained, cytoplasm (white arrows). A few muscle fibers have internal nuclei. 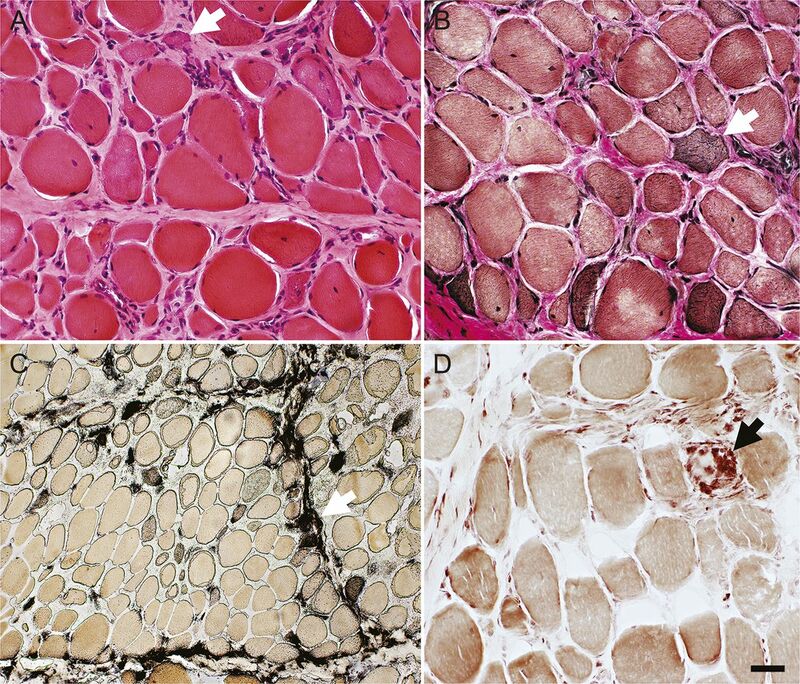 Endomysial connective tissue between muscle fibers is increased. (C) Alkaline phosphatase stains perimysial connective tissue and the cytoplasm of scattered small muscle fibers (white arrow). (D) Acid phosphatase stains scattered cells in the perimysium and cells associated with a necrotic muscle fiber (black arrow). Scale bar = 50 μM for A, B, and D and 100 μM for C. HMGCR = 3-hydroxy-3-methylglutaryl-coenzyme A reductase. Myonuclei are often enlarged (dark arrow) with clear centers (dark arrowhead) or irregular shapes (light arrowhead). Internal nuclei are common. Some myonuclei are in abnormal clusters or clumps (light arrows). Scale bar = 18 μM. HMGCR = 3-hydroxy-3-methylglutaryl-coenzyme A reductase. (A) Perimysial pathology with histiocytic cells and widening (hematoxylin & eosin stain). (B) Most cells in the perimysium are histiocytic and stain for acid phosphatase. (C) Muscle fibers at the edge of some fascicles are small and may be dark-stained (immature) (nicotinamide adenine dinucleotide stain). (D) Fragmentation of perimysial connective tissue (Gomori trichrome stain). (E) Cells in perimysial connective tissue are scattered, large, and irregularly shaped (nonspecific esterase stain). (F) Necrotic (dark) muscle fibers, with C5b-9 complement staining of cytoplasm, are scattered through the muscle but may have increased frequency at the edge of fascicles, a feature common in immune myopathies with perimysial pathology. 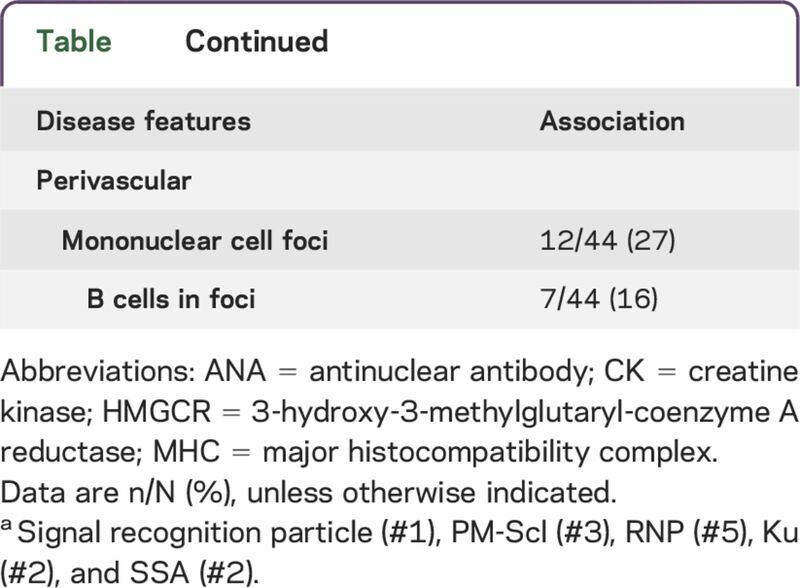 C5b-9 complement is also deposited in perimysial connective tissue, occasionally extending into the endomysium. Scale bar = 100 μM for A, B, and D and 50 μM for C, E, and F. HMGCR = 3-hydroxy-3-methylglutaryl-coenzyme A reductase.